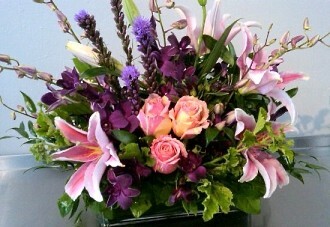 Call ALPHA FLORAL... the place where flowers are uniquely designed and affordably priced. Established in 1935, Alpha Floral is a family-owned and operated business backed by more than 55 years of combined design experience. We’re a local Santa Barbara, California florist that features a lovely variety of fresh flowers and creative gift ideas to suit any style or budget. We hope you enjoy your online shopping experience with secure 24-hour ordering right at your fingertips. If preferred, you may call us to place orders direct at (805)-965-5165. Days/times will vary depending on special events. 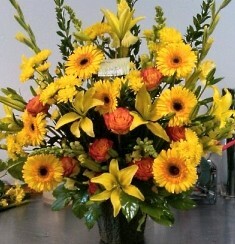 Open Sunday for special deliveries. Please call 805.965.5165 to confirm. Variety of All Occasion Gifts ~ Shop from our Green Plants, Blooming Plants and Dish Gardens for a gift that adds life to any room or office. We also offer Ceramic Containers, Urns, Baby Gifts, Greeting Cards, Home Décor, Scented Candles, Silk Flower Arrangements, Plush Stuffed Animals, Balloons and more. Don't forget to ask about our Gourmet Gift Baskets made with high-quality Chocolates, Select Wines and Seasonal Fruit. Wedding & Party Flowers ~ Call us to schedule a consultation, so we can help you start planning flowers for your dream wedding or any special event – large or small. Our talented designers create bouquets, flower arrangements, archways and on-site decorating with each client’s individual style and budget in mind. Sympathy & Funeral Flowers ~ Remember, you can also depend on us when you need to send flowers for the funeral of a friend or loved one. We will design and deliver a funeral arrangement that beautifully conveys your feelings of sympathy and serves as a lovely tribute to the deceased. 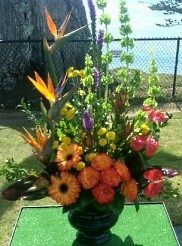 We also offer standing cemetery wraps to keep flowers on-site all year long. Thank you for visiting our website with flowers delivered fresh from your local Santa Barbara, CA flower shop, Alpha Floral!